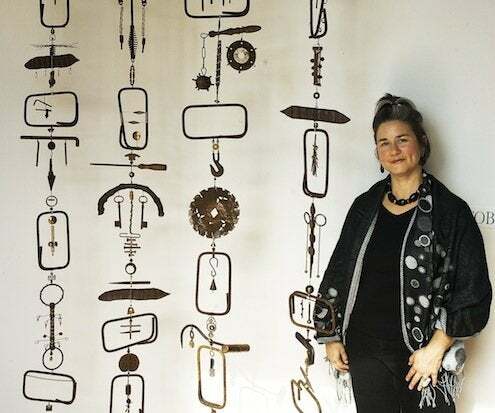 Artist Elayna Toby Singer next to her larger-than-life kinetic sculpture, "Re-tooled"
When artist Elayna Toby Singer contemplates a new mixed media assemblage, she pieces together objects from both natural and manmade worlds, re-imagining them in a fresh context. 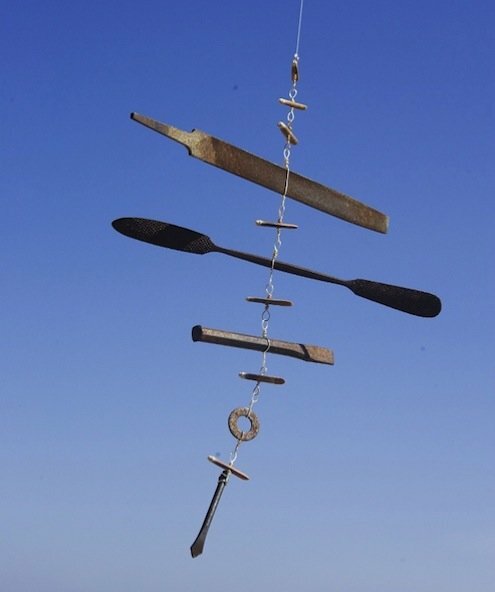 “A single object’s shape, color, and texture can instantly rouse my artistic vision,” says Elayna, whose first found-object kinetic sculpture was inspired by a crushed and discarded pair of eyeglasses. 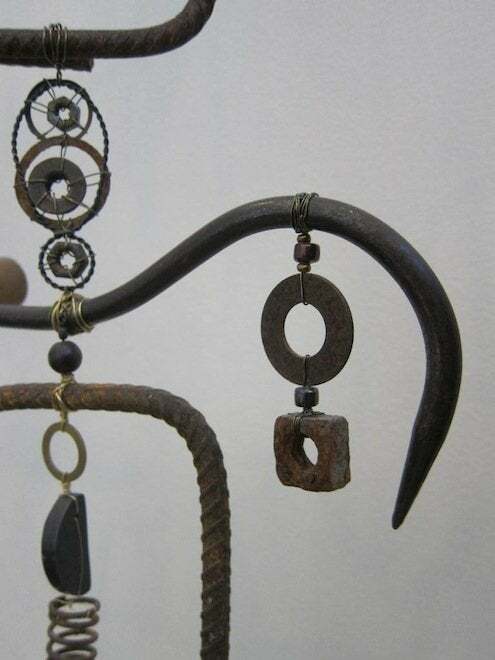 While she selects twigs, pods, gemstones, beads and shells from relegated jars, bowls, and pots in her studio, no creative gestation is quite complete without a visit to the rust farm. The rust farm is a 50 sq. ft. patch of backyard where assorted metal objects—found, bought at flea markets, and dropped off by friends—are laid out on wire mesh shelves and left to weather in the tropical South Florida climate. 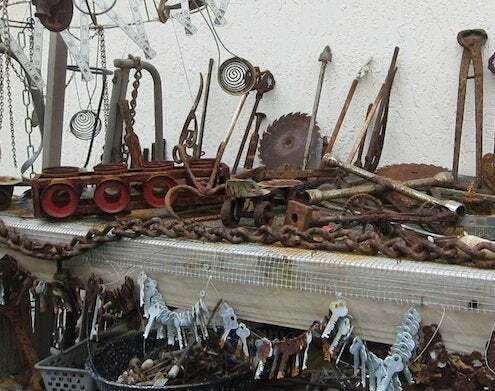 With this layout, Elayna is able to survey the patina on each implement, key, spoon and screw, then easily harvest the ones that have turned to her liking. “Rust happens,” says the artist, who—always partial to warm, fiery, earthen hues—admires the crusty and random burnt orange natural aging process. Movement is at the heart of every 3D composition, as Elayna rises to the challenge of animating inanimate objects. “The wind is my favorite weather element. I love how things interact with it,” she says. With each new project comes the task of making an aesthetically pleasing piece while creating balance, securing objects, and encouraging spinning, twirling, and chiming. Her method does not rely on power tools but thrives on ingenuity, patience, and handwork. She builds each piece using cold connections. There is no soldering or welding, but rather wrapping, knotting, and linking with wire and fiber. Elayna Toby Singer's "Shape Shifter"
“Re-Tooled” (shown top) is Elayna’s largest piece to date. It measures 7 feet high by 52 feet wide and contains more than 150 hardware elements and tools, plus over 400 glass and wooden beads. She completed the artwork in one month, working in high gear (in addition to a full-time job as the director of Public Art for Palm Beach County) into the wee hours of the night. “Re-Tooled” is an awesome piece to behold. 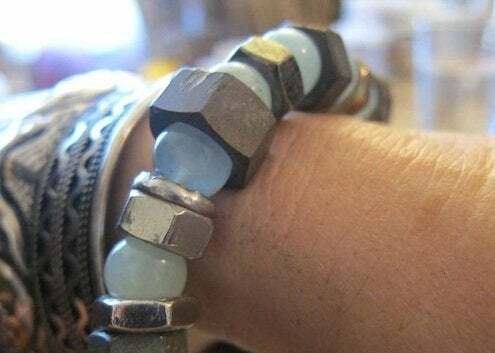 Her smallest creations are adornments, and she employs the same creative techniques for each piece of jewelry. While Elayna’s personal stash of objects is inspiring enough, she invites commissions that include clients’ meaningful objects and trinkets. For more information on Elayna Toby Singer, click here.